The CM's failure to keep his house in order coupled with the arrogance of ministers and top leaders riled BJP cadres, reports R Krishna Das. After the first phase of polling on November 12 in Chhattisgarh, top guns of the ruling Bharatiya Janata Party and senior functionaries of the Rashtriya Swayamsevak Sangh gathered in Sarguja for a crucial meet to devise the strategy for the second phase. Two top RSS office-bearers left Sarguja to visit the pockets that were supposed to go to the polls in the second phase on November 20. They were on a mission as two RSS functionaries of the highest level never travel together. The party's grassroots workers and cadres of affiliate organisations were fuming because the resentment against the Raman Singh government had come out into the open. The chief minister failed to keep his own house in order. The arrogance of ministers and top leaders, coupled with the imperious style of functioning of bureaucrats handpicked by Dr Singh, had riled the cadre. Subsequently, it created an undercurrent of hostility against the BJP among the common people. The mission did not yield the desired results. The Congress manifesto offering sops to the farmers and the youth, and the demoralisation of the saffron cadre resulted in a humiliating defeat for the BJP in Chhattisgarh. "The resentment of the cadre appeared to be more crucial as the BJP had been wiped out in the first phase in which the Congress manifesto did not have any impact because it was released later," said political observer Dhanvendra Jaiswal. In the first phase, the BJP only won 1 out of 18 seats. The Congress swept the Chhattisgarh polls by winning 68 assembly constituencies against the BJP's 15. The alliance of the Janata Congress Chhattisgarh, headed by former chief minister Ajit Jogi, and the Bahujan Samaj Party won seven. The JCC, as expected, failed to split the anti-BJP vote. 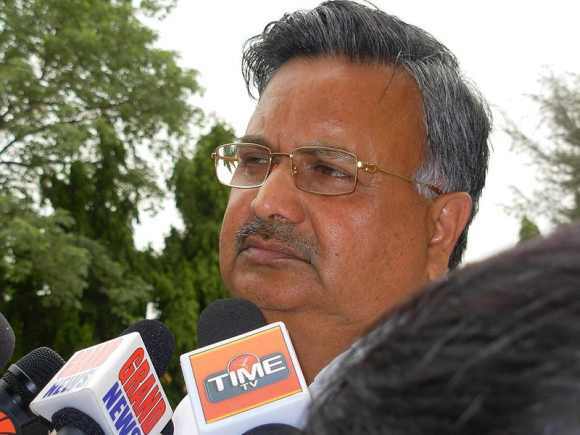 Did Raman Singh take Rahul Gandhi too lightly?